The Clean Eating Challenge I participated in last month ended on March 30. In my final post of the challenge, I made the audacious declaration that, uh, I might just keep up with my clean eating ways. Today is April 10, and with a few minor but noteworthy exceptions, I am still refined and processed foods free! It reminds me a little bit of when I became a vegetarian. I gave up meat just to see if I could do it, and, 15 years later, I’m kind of like “Oh yeah, I guess I still don’t eat meat.” (I did add seafood back in 10 years ago.) This just has not been as excruciatingly difficult as I expected it to be. It’s actually been kind of (dare I say it?) fun. Now, I’ll take a moment here to pause and confess my sins: I had (locally made) ice cream at a festival last Saturday. 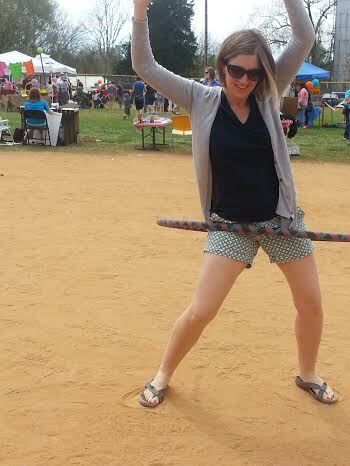 (The same festival at which I discovered for the first time in my life that I could hula hoop.) That night, I went to a birthday dinner for a friend. I ordered pretty healthy food (sweet potato bisque, potato leek tart with salad, cheese plate), but did indulge in the bread basket and a bite of dessert. Yesterday, there was the chocolate croissant. I do not think I would have made it this far without those exceptions. I’m doing it, I’m really doing it! But what’s different from previous diets or detoxes is that I didn’t eat that ice cream cone and then declare Saturday the end of eating clean. I just got back to it on Sunday. Which makes this feel more like a lifestyle than a gimmick. Yes, I’ve lost a few pounds, and that’s nice. No, I don’t have boundless energy or total euphoria at all times. (Oh, and did I mention that last week my face broke out like crazy?) But I do feel good. And I think part of it is the physical effect of eating better, and part of it is the psychological boost that comes with making good decisions for yourself. I’ve tried so many new recipes in the last couples weeks, which has really been fun. Most have been winners, though there have definitely been a few losers. Let me get that one out of the way first. It was the pancakes again. We had so many leftovers from the Sunday, and I couldn’t bring myself to throw them out. I hid them under sliced bananas and syrup, but Noah still refused. When I was honest with myself, I didn’t want them, either. So into the trash they went. Folks, I need your advice: what GF flours work best for pancakes and other baked goods? I bought buckwheat and brown rice flour because they were the cheapest, but most recipes I find call for coconut or almond flour, which are hard to find and expensive. And they usually require more than one variety in one recipe. Any tips? I’m not going exclusively gluten-free, but I’d like to explore the options. 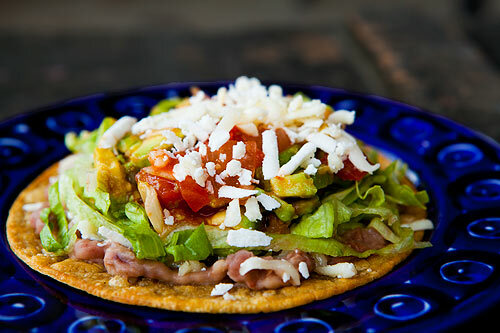 A tostada is basically a flat crunchy taco. I made them one night when my fridge was looking pretty bare, and I kind of panicked about what we were going to eat. But they turned out to be a hit. Rather than include the full recipe for these, I’m going to link to the separate parts on my Pinterest Clean Eating Challenge page. First, I made my own tostada shells (I used the baked method) and refried beans (deceptively simple, really yummy). I sort of improvised, but this recipe is probably the closest to how I made the beans (I used canned beans with their liquid). This is a great meal for kids (and husbands who hate tomatoes), because everyone can pick their own toppings. After spreading a layer of beans over the tostada shell, I loaded mine with shredded cheese, lettuce, tomato, avocado and sour cream. The best thing about the tostadas was that they made great leftovers. I made extra shells and beans, so I had a tostada for lunch at least two days last week. Broken up, the shells also stood in nicely for tortilla chips with leftover chili. I first tried this recipe, from the September 2012 issue of Southern Living, during my failed detox. The whole family liked it, but I sort of forgot about it. I tried it again last week, and was reminded how good it was. I’ll admit, it sounds a little weird. 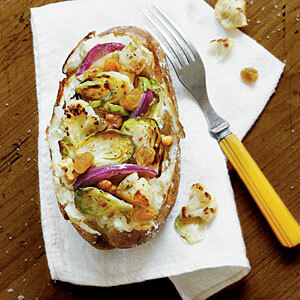 But it’s a nice combination of sweet, savory and crunchy, and it works since we all like cauliflower and brussels sprouts. It takes a while, though most of it’s cooking time. 1) First, bake the potatoes: preheat oven to 400 degrees. Drizzle 3 large baking potatoes with 2 tsp. vegetable oil (I used grapeseed) and rub with 2 tsp. kosher salt. Place on a 15-x10-inch jelly roll pan. Pierce potatoes several times with a fork. Bake 1 hour or until tender; cut in half. 3) Toss cauliflower mixture with raisins, walnuts and vinaigrette. Spoon over potatoes. Okay. You know My biggest fear about the clean eating challenge was giving up sugar, and there is no one who loves a cookie the way I do. When I found this recipe, I was given a bit of hope, though I was still skeptical. But guys, these are delicious. Mix well. Put on cookie sheet in rounded teaspoonfuls. Bake at 350 for 8 minutes (it’s ok if they don’t seem done!) Let set for 5 minutes. 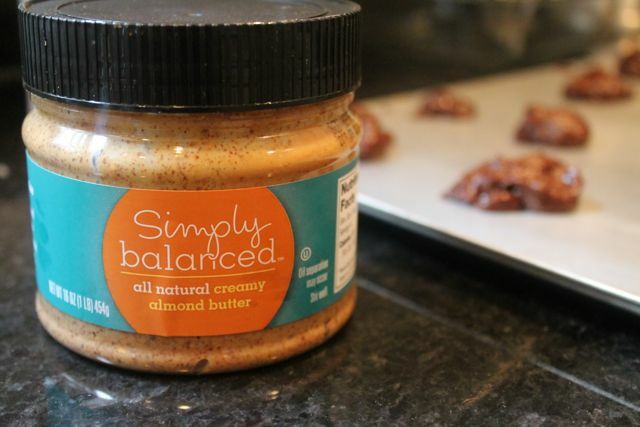 1) Good Lord, almond butter is expensive! 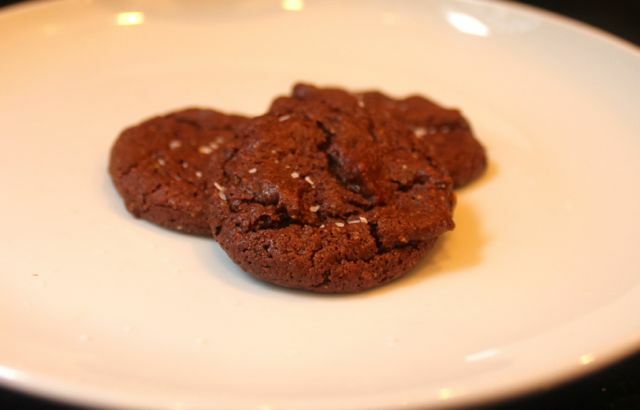 3) On the first day, they’re perfectly cookie-like. But on subsequent days, they start to soften back into the ingredients from which they came. I put them in the fridge, which firmed them up a little, but I still had to peel them off each other. There was one other thing, which, if I were applying the rules of “winner” and “loser” fairly, should put this cookie in the latter category, but doesn’t: Noah wouldn’t eat these cookies. I made them the day after the whole pancake debacle, and it just so happened that their dark brown roundness sort of resembled the buckwheat pancakes. Noah even said that the cookie tasted like the pancake, though Pat and I can tell you definitively that is not true. But in this case, I don’t mind if Noah doesn’t like them. If there’s one personal philosophy that hasn’t been changed by clean eating, it’s this one: the more cookies left for me, the better. I love that baked potato. I’m going to make it this weekend. And I’m really excited about these cookies without sugar. …Because I’ve run out of sugar and I’m on a SPENDING FREEZE! PS: my hubby hates tomatoes too! Thanks, guys! I have to say, I hesitated to post the potato recipe, because I wasn’t sure if its tastiness would translate. So I’m glad it looks good to you! Well, B, when you see the cost of the raw honey and almond butter, you may wish to revert to something made with white flour and sugar. Because while I think eating clean can be done fairly inexpensively, BAKING seems to be a different story.